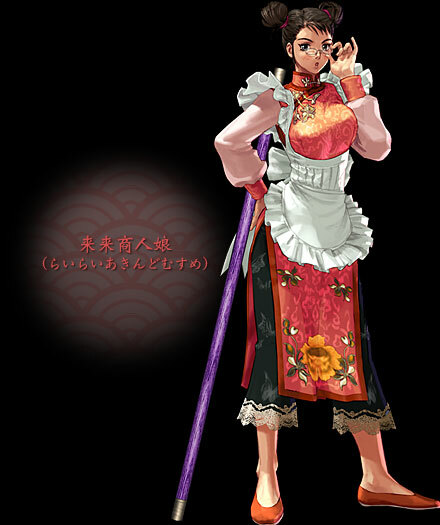 Hualin is one of the shopkeepers appearing in Soul Calibur III, along with Valeria and Lynette. Her goal was to become the finest weaponsmith in the world. There was a mountain where martial arts experts gathered and dwelled. At the foot of this mountain is a small village, where it was said that a man who led a caravan settled down and opened a shop. Hualin entered the shop as an indentured servant, and thus began her life centered around weapons. While going through her daily chores and caring for weapons, she found her life's calling. From there on her training as a weaponsmith began. The shop sold weapons from all over the world, but naturally because of the geography, Asian weapons seemed to predominate. Nonetheless, she also encountered western weapons and Arabic knives from the Middle East. Yet there was still so much she had not seen. Hualin gradually wished to see all the weapons of the world. Hualin first met old man Cepheus one day near the end of the year. Cepheus was on his way back from a city in Ming after making a huge purchase and stopped by to visit an old friend. There, he was astonished by Hualin's skills, praised her and lamented her situation. Hualin's skills handling Ming weapons were phenomenal, but her handling of other weapons were inexperienced at best. He saw her potential and gift, so he asked the shop owner if he could take her with him to work in his shop. Cepheus' shop was located in a city where east meets west, and there Hualin would be able to see and experience more. With Hualin's talent, there was no question that she could eventually learn to handle any kind of weapon. The weapons shop owner also recognized Hualin's potential, but at the same time, it would be a huge loss for the shop to let her go. Upon much agonizing, he made his decision, and Hualin went on her way to Cepheus' shop. Day after day, Hualin sat in Cepheus' workshop whetting all kind of weapons. As he looked at the razor-sharp edges honed by Hualin, Cepheus was sure that it would not take long for her to become the finest weaponsmith in the world. Though she looks pretty cool as a design, her fighting style was the most unrealistic style in Soul Calibur 3... and that's putting it nicely. Her "growing" staff (much like the one Son Son uses) just doesn't fit into the series at all. I think putting that style in the game (along with the rest of the silly bonus styles) is one of the dumbest things Namco has ever done. 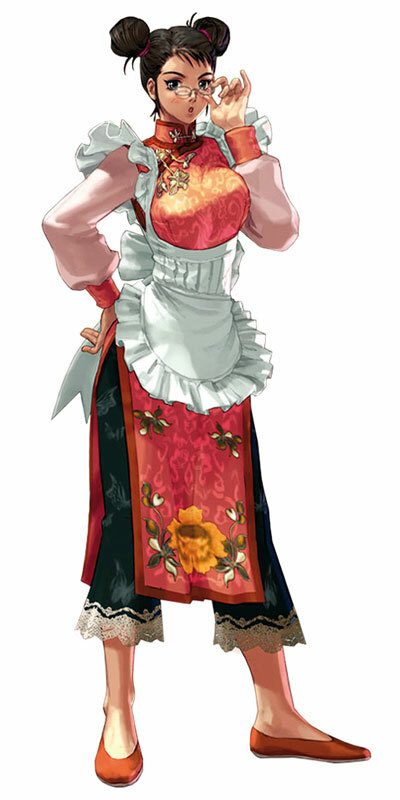 On the bright side, Hualin was a cool hostess for the weapons shop in SC3... no complaints there.